Where: Ho Chi Minh City (Saigon), Hanoi, Halong Bay. Vietnam, South East Asia. What: Long Bien Bridge, Hang Ma Street, Dao Ho Truck Bach Buddist temple, Ho Chi Minh Mausoleum, Lenin statue, Hanoi Citadel gates, Temple of Literature, the pink Tah Dinh Church, Bitexco Tower, Pham Ngoc Thach roundabout, Viet Pride, Communist symbolism, People's Committee Building, Ho Chi Minh Post Office, Halong Bay's iconic limestone peaks, Floating Village How: Plane, taxi, walking, luxury tour bus, sailing boat, bamboo boat. Wildlife spotting: Vietnamese singing birds in cages, crabs. Illnesses or mishaps: Dealing with a last-minute flight cancellation and being ripped off by a taxi driver who used the old decimal point trick with the help of a tampered taxi meter. This must rank as my most hastily organised trip abroad ever. A week before arriving in Ho Chi Minh City in Vietnam there were absolutely no plans to travel to the country. None. In travel, though, when an irresistible flight offer presents itself, you have to grab it with both hands. My criteria for deciding to travel anywhere is really very simple. Is it safe? Have I been there before? Return flights from Sydney to Ho Chi Minh for £100 was an opportunity not to be missed - even if this was during Vietnam's rainy season and even if the flight times were rather horrific (departure time 2am, anyone?) 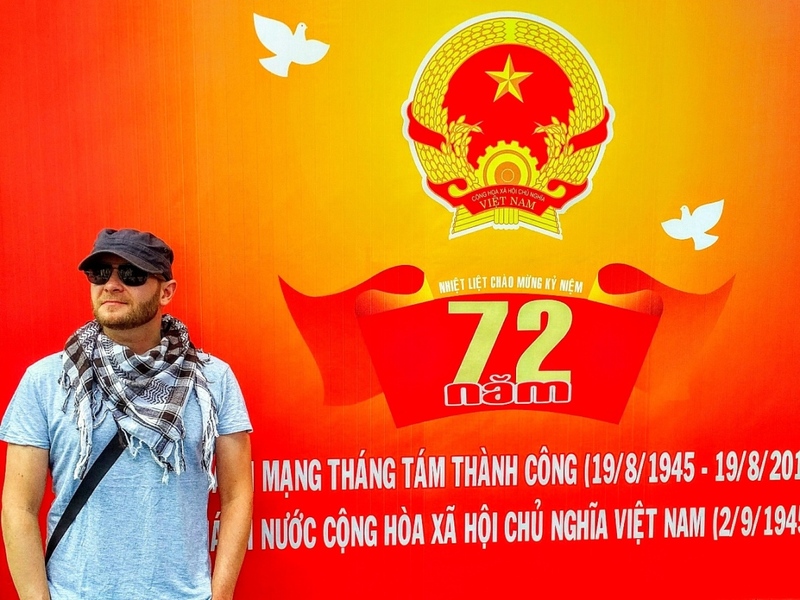 With scant knowledge, no itinerary and with virtually no idea about what to do and where to go, I touched down on Vietnam soil, and in doing so, made it to my 76th country. On the surface, Vietnam is a contradictory beast. Its red flags featuring yellow stars and hammer and sickle emblems fly from all official government buildings, and often every other building too. This seems at odds with the rampant market economy which swirls all around you and which is geared towards emptying every last Dong out of tourists' pockets. School kids wear little red neck scarves like those you see in communist propaganda posters and yet in the next street international luxury brands like Versace and Prada sell their wares alongside American chains like KFC and Starbucks (the irony of American icons like these is, I suspect, not lost on visitors to Vietnam). A communist state with a friendly approach to capitalism? It takes a little getting used to but, of course, is not unlike the communism-capitalism fusion proving so successful in neighbouring China. It is interesting to see how two seemingly contradictory social systems exist in the same space. Alas, despite outward appearances (the candy floss sellers, the slow but steady proliferation of corporate glass towers, the staging of VietPride), this country is one still very much rooted in the moment the communist north defeated the republican capitalist south; the moment in 1975 when America effectively lost the Vietnam War. And there is no getting away from it: Vietnam is one of the most corrupt countries in the world. It is a single party state and there are no elections of any import. Indeed, Vietnam is one of only four single party states left in the world, sitting alongside China, Cubaand North Korea. Similar to China's 'Great Firewall', Vietnam controls its population's access to social media through what has been dubbed the 'Bamboo Firewall', regularly switching off access to Facebook and other sites which pose a threat. The BBC's news site is blocked completely. As our guide was to later warn, posting unflattering comments online about the government will land you in jail for a few days. The state monitors the online activity of its people and, even though the majority of businesses catering for tourists subscribe to the private, more expensive internet company which offers more privacy and less state interference, I remained very mindful about what I was posting online during my time in Vietnam. A long-winded rant about the state of the infrastructure and the poverty of the population due to decades of government ineptitude, not to mention police corruption, may not have gone down too well. Better safe than sorry. I kept my posts simple. Ho Chi Minh City is a city with two names - and using either has the potential of betraying your inner political thoughts. The city's name was changed in 1975 when the communist north defeated the capitalist south. In doing so the new government renamed Saigon after the great Vietnamese communist leader Ho Chi Minh. Calling the city Saigon in conversation reveals your dissatisfaction with the current communist order. Using Ho Chi Minh City instead shows you to be a communist supportive of the governing party. 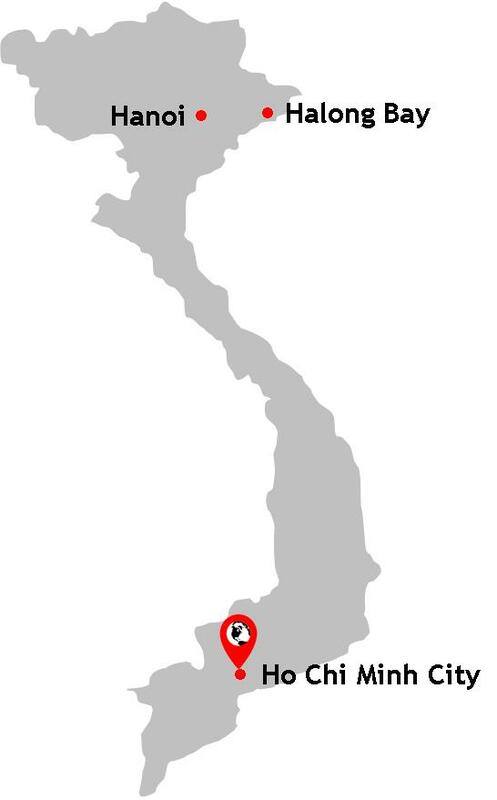 As always in countries with chequered, difficult pasts (head over to my pages on Burma and Northern Ireland in the UK), language and politics often intersect at the naming of places. In a tale relayed to me by a local about the recent flooding in Ho Chi Minh City, a resident unhappy with the regime declared, "This would never have happened in Saigon." It's therefore advisable that you tow the party line and refer to Ho Chi Minh City as exactly that - even if it is a bit of a mouthful and 'Saigon' temptingly less so. It's worth pointing out at this point that when you fly into Ho Chi Minh City you fly into an airport with the three letter aviation code "SGN" signifying Saigon. I have decided to use both Ho Chi Minh City and Saigon interchangeably in this Chronicle. Ho Chi Minh City is an effervescent, crazy swirl of sounds, sights, smells and scooters. Among the first things you will notice are the millions (yes, millions) of scooters swarming from, and heading in, all directions. Even the pavements are fair go for a Vietnamese person in a hurry. Nowhere is safe. Add to this the fact that pavements are death traps in themselves (wires sticking out, missing paving slabs or fading out altogether leaving you marooned at a particularly horrific intersection) and it's safe to say that traversing the city on foot, as we did, is a high octane, dangerous urban assault course requiring sturdy footwear, tenacity and an ability to pick your way through chaos without dying or snapping an ankle. Vietnam's scooter invasion is a relatively recent phenomenon but has become firmly embedded in city life since replacing the humble bicycle in the 1990s, arguably becoming iconic in their own right. No photograph of a Vietnam city scene would be complete without a passing scooter rider sporting a retro-style helmet. 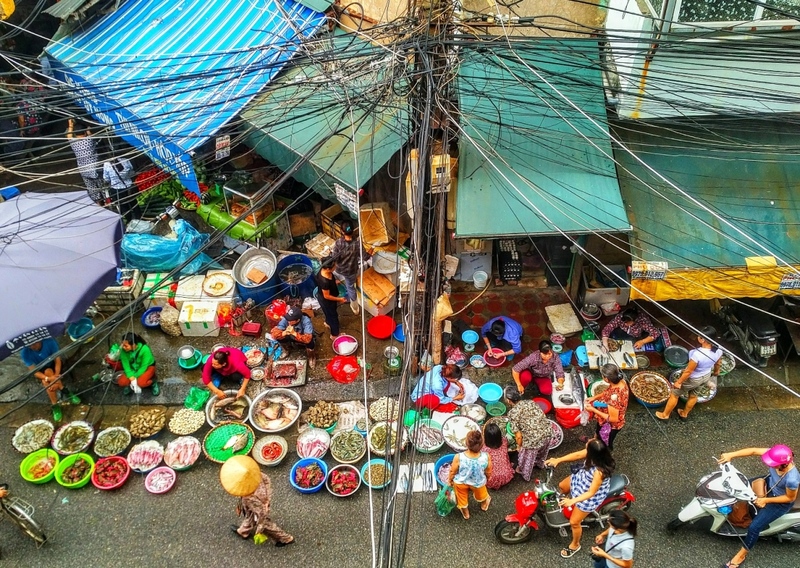 It's a quirky, manic sight and goes a long way to adding to the general freneticism of Saigon; large mechanical wasps buzz, beep and bother wherever you go. Crossing the road (at a pedestrian crossing) poses you with another level of challenge entirely and a counter intuitive measure is required here: walk slowly across and don't run. If you pace yourself, scooter riders have time to adjust their direction and weave around you. A key point to note here is that Zebra Crossings are different in Vietnam: the green man merely gives you the right as a pedestrian to walk into the perpetual flow of oncoming traffic which continues in spite of you. Initially daunted, I got the hang of it quite quickly. I had to: it's that or go nowhere. On occasion the swarm-like scooter traffic was transformed into an absurd theatrical performance, with zooming vehicles dancing to soothing oriental-style music which was being piped through the city's loud speakers mounted on lamp posts. Very communist and rather thrilling to watch. We based ourselves in District 1, the location of choice for many an international traveller. Quite why there were so many 'foot massage' parlours required in a city where every inhabitant scoots everywhere began to bother us. And then it all became clear. Unbeknown to us we had booked a hotel in the slightly seedier part of town where foot massages were a euphemism for a far more intimate service. Women with cake-like layers of make-up and silky dresses lingered at the windows like birds in cages in scenes reminiscent of my time in Amsterdam's red light district. We had to run the gauntlet along this main street each night to eat and, on seeing 'rich' Westerners passing, shouts to come in for a massage became particularly loud and emphatic. Ho Chi Minh City is a destination with few notable landmarks to speak of. There is no one building which captures a sense of the city and its people. A visit here is about appreciating the sum of its parts. 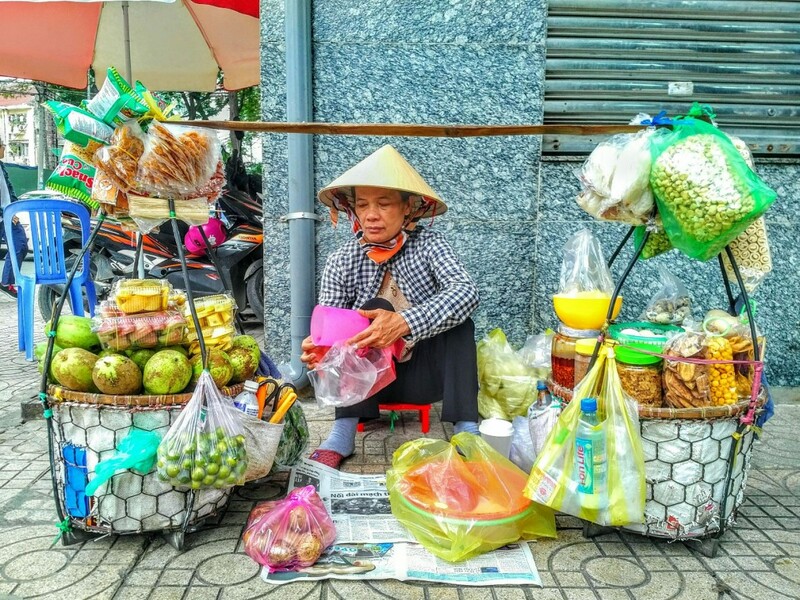 Rather, Saigon is a collection of disparate influences and styles, a place with multiple layers which are themselves a result of Vietnam's chequered colonial past. Indeed, some of Saigon's most striking buildings, including the city's Central Post Office and the People's Committee Building, come from a century of French Colonial rule. And yes, predictably, they also gifted Saigon with that archetypal hallmark of French cultural power: the Notre Dame Cathedral. My slightly disparaging tone here comes from frustration. 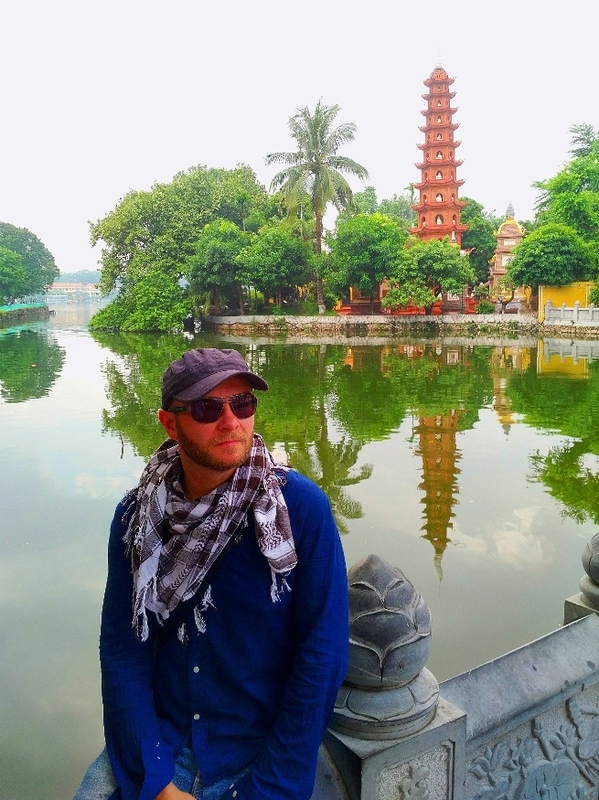 I travel to Vietnam to see Vietnam, its culture and what sets it apart from other places. With a little blurring of the eyes and a little selective hearing, in parts of the city, I could quite easily have convinced myself that I was meandering down Parisian streets. The problem with colonialism, apart from the obvious horrific consequences on the population at the time, is that everywhere begins to look alike; an incongruous pastiche of somewhere far far away which does not belong: out of place and devoid of local culture and character; I didn't like the British buildings in India and Burma, the Russian buildings in Poland, nor the French buildings in Canada. Whilst these architectural aberrations speak of invasion, colonialism and certainly not of Vietnam, they do, however, help to tell its chequered, complex story. Whilst they offered a photo opportunity, I did feel a little disappointed and hungry to see Vietnam - not the architectural impositions of the French. I infinitely preferred, therefore, to take photos of people wearing the iconic conical hats, characterful fruit sellers on street corners, the hustle and bustle of the city's indoor markets and the red symbolism of the Vietnamese communism state instead; an attempt to, superficially at least, capture a Vietnamese essence amongst the irritating, soul-sapping architectural deja-vu. Street portrait 1: some of my most favourite photographs from my time in Vietnam are of the local people themselves. This lady's sign says she is selling, "fried noodles", "fried vermicelli", and "wet cake". Wonderful. Street portrait 2: a woman sells a variety of fruit and home-made street snacks to go. Communist hoardings along Le Duan. 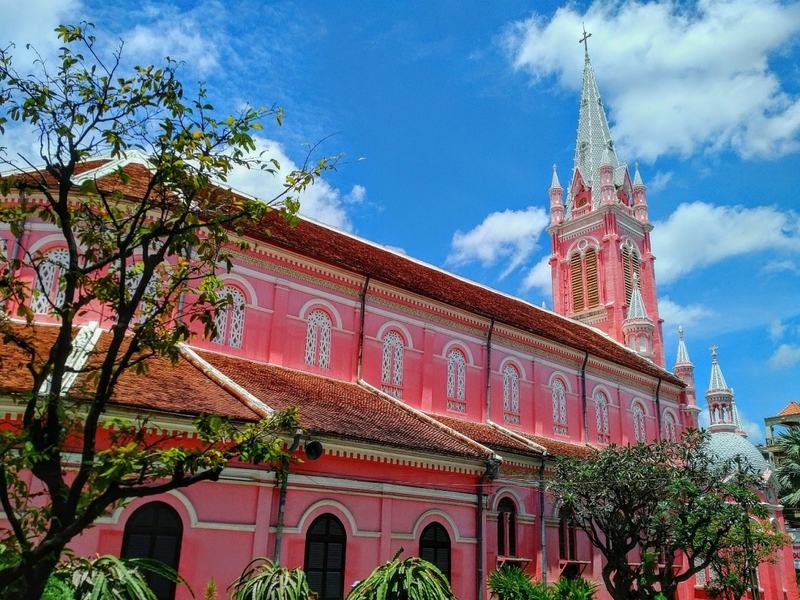 The dissonant pink Tan Dinh Catholic Church built during the period when Vietnam was part of French Indochina. 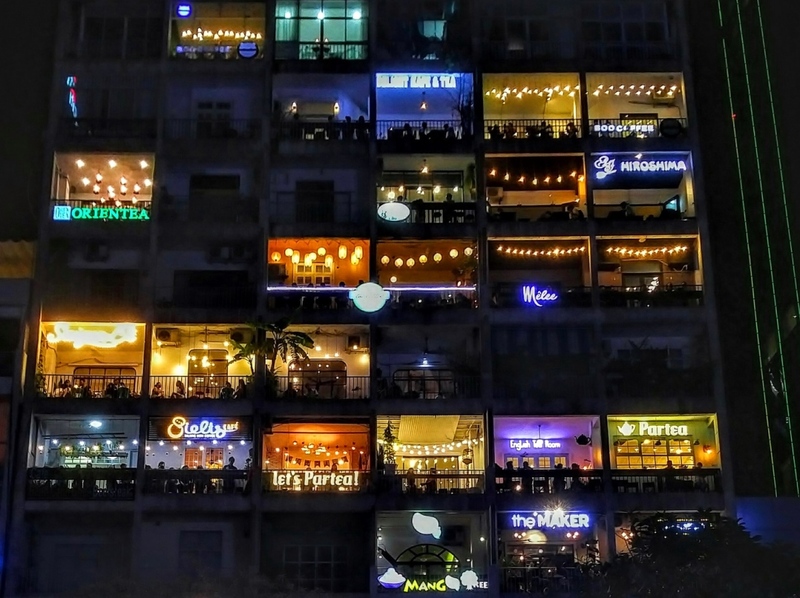 Night-time Saigon: an former apartment block has found a new life as a vertical food court; every 'apartment' is now a restaurant or cafe. 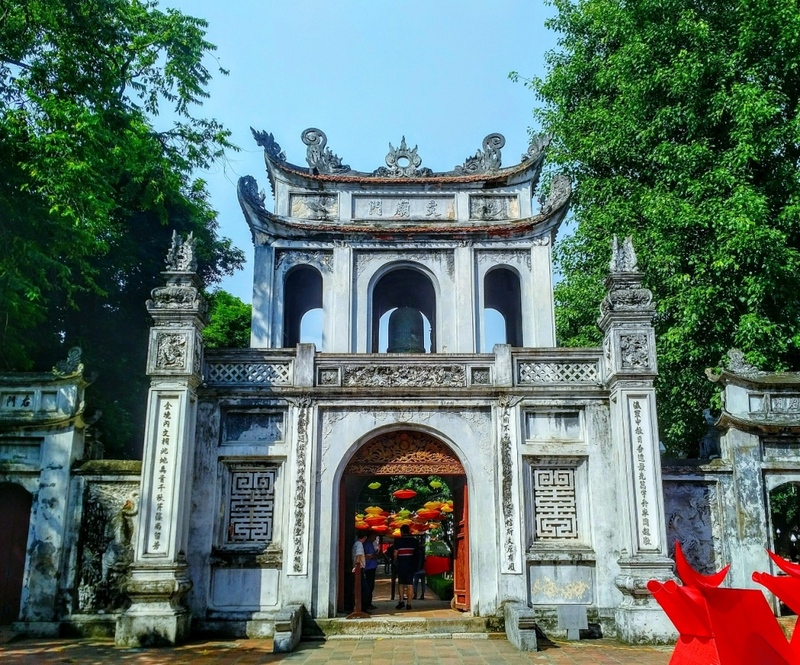 Getting to Hanoi from Ho Chi Minh City can be achieved by (a) undertaking a gruelling 36hour train journey or (b) a two hour flight using one of Vietnam's two domestic carriers 'VietJet' or 'Jetstar Pacific'. It goes without saying that, with a tight itinerary, we opted for the latter. We based ourselves in the Dong Da district of Hanoi, a world away from the swanky hotel chains and exclusive stores selling luxury brands. Dong Da is as authentic as Vietnam gets - and for this reason alone it was to be cherished. For an absolute pittance, we booked a hotel room with a balcony which looked down onto the Ngo Si Lien Alley characterised, as it was, by a fizzing local economy operating in all its stinky, gruesome craziness. Women sat cross-legged on the floor with large bowls of every colour and material writhing inside of which was every sea creature known to man (as our guide was later to remark, "Vietnamese people eat anything moveable [sic], except humans - thankfully"). One woman sat robotically cutting the heads and tails off of small fish with scissors, picking them up from one bowl, snip-snipping, and then flinging them into another. Another woman butchered an unidentifiable animal carcass, its intestines oozing into a bowl at the foot of her makeshift operating table. This place was alive and kicking - even if most of the creatures there were dead, or at least soon would be. My mouth was in constant conflict with itself: dropping open at the sights but then needing to close in a bid to prevent swallowing chunks of fetid, humid air. Mobile traders on scooters, wearing conical bamboo hats, sold everything from flowers to unidentified fried food objects. Above this assault on the senses dangled a spaghetti junction of cables criss-crossing crazily from every pole and building to, seemingly, every pole and building; an electrified spider's web which seemed to act like a canopy, keeping the humidity, petrol fumes and general stench at street level. Dong Da was a scintillating and stomach churning place to stay - and precisely the place you should stay. Not only was it light on the pocket, but it was Vietnam in Vietnam, not Paris or anything else. When it came to head off to the airport, I was both glad and sad to leave this little alleyway, with all of its intensity, colour and character. Having flown north from Ho Chi Minh City by some 700 miles, Hanoi's heat and humidity bordered on the unbearable (our hotel window each morning developed condensation on the outside such was the heavy water content of the air). This is, of course, the reason many choose not to travel to Vietnam at this time of year and was the most likely reason our air fare was the price it was. Our first attempt to see the sights of the Vietnamese capital armed with a camel-like backpack containing water, ended in failure darting, as we did, into every cafe or building with air conditioning in a bid to cool down and dry the increasingly embarrassing sweat patches on our clothes. The reality was that trying to traverse the sights of Hanoi in September just wasn't safe and so, wisely, we hired the services of Minh who, for d1,200,000 (or $50USD), drove us around the list of places we'd hastily plucked from our copy of the 'Lonely Planet Guide to Vietnam' and which had to be re-written into Vietnamese for him by our hotel receptionist before we set off. Being chauffeured around in an air conditioned car to parachute in and out of important cultural locations isn't exactly intrepid traveller I admit but, I'm afraid, given the weather, was the only viable and safe option. I had learnt my lesson the hard way a few years back when I headed out into the 42' heat of Kuwait City and ended up falling upon the mercy of a kind restaurant owner who took pity on me and let me rest in his restaurant for an hour, feeding me water and then calling me a taxi to get me back to my hotel safely. Sometimes it's best to know your limits and heed your body's warnings. The fizzing local economy in the Ngo Si Lien Alley in Dong Da, and the view from our hotel balcony. This is as Vietnamese as Vietnam gets. The enticing entrance to the Temple of Literature. 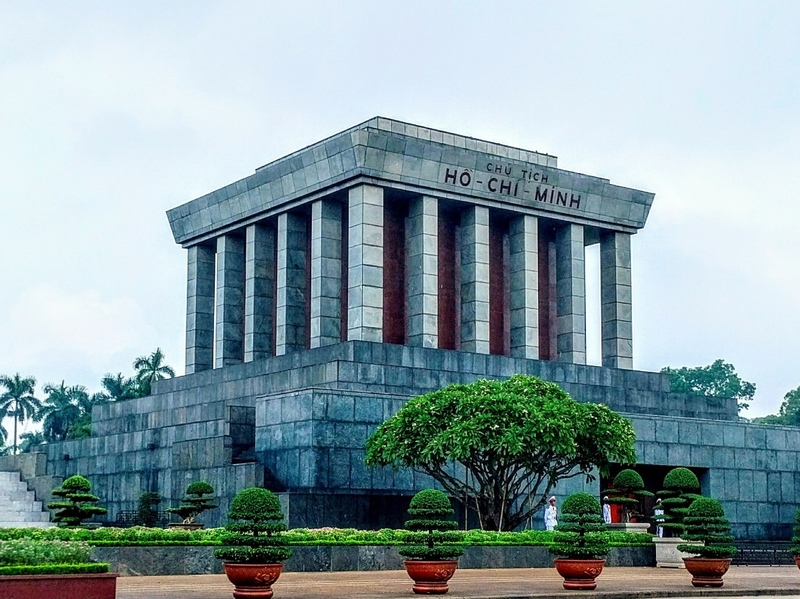 The austere edifice of the Ho Chi Minh Mausoleum, an important place of pilgrimage for many Vietnamese wanting to pay their respects to 'Uncle Ho'. 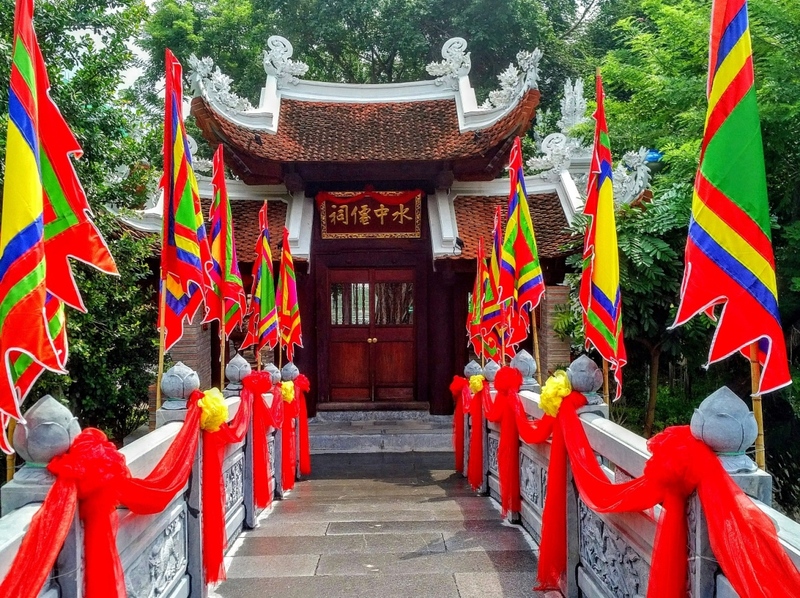 Beautiful Buddhist flags adorn a little stone bridge leading to a petite temple at Hoan Kiem Lake. 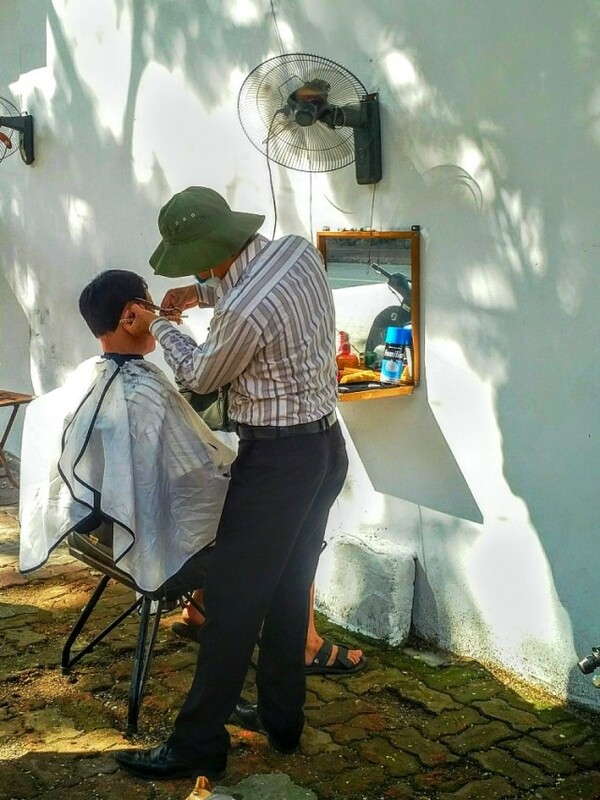 A man has his hair attended to 'in' an outdoor barber shop - complete with wall-mounted fan! One of the many reasons for travelling to Vietnam: the Tran Quoc Pagoda on Ho Tay (West Lake). 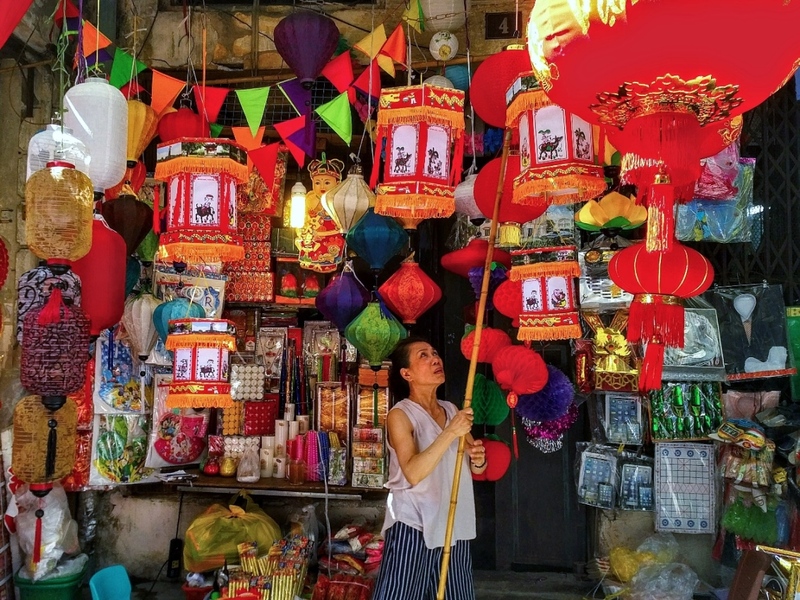 A woman adjusts her lanterns along the incredible technicolour Hang Ma Street, famed for selling cultural and religious paper goods. 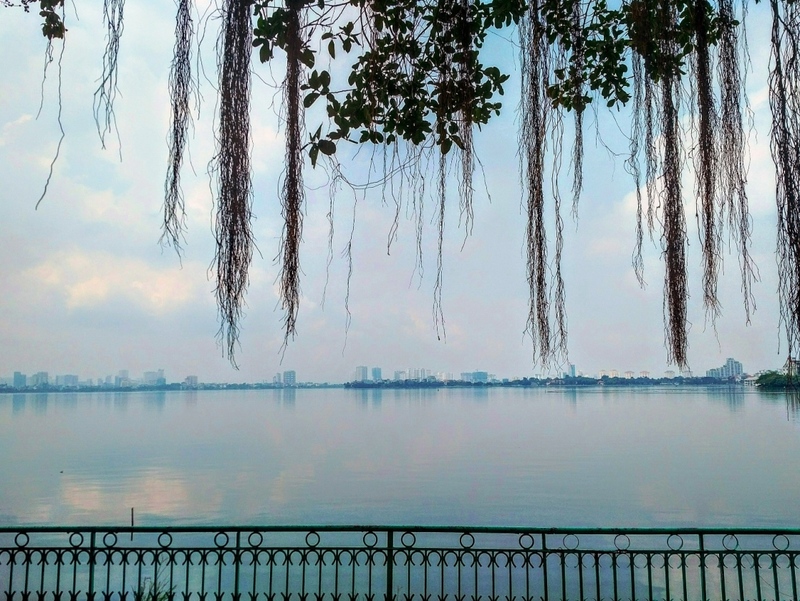 Vertical roots drape over the horizon of Ho Tay (West Lake). This scene captures a sense of the humidity and heat we experienced on our journey here. 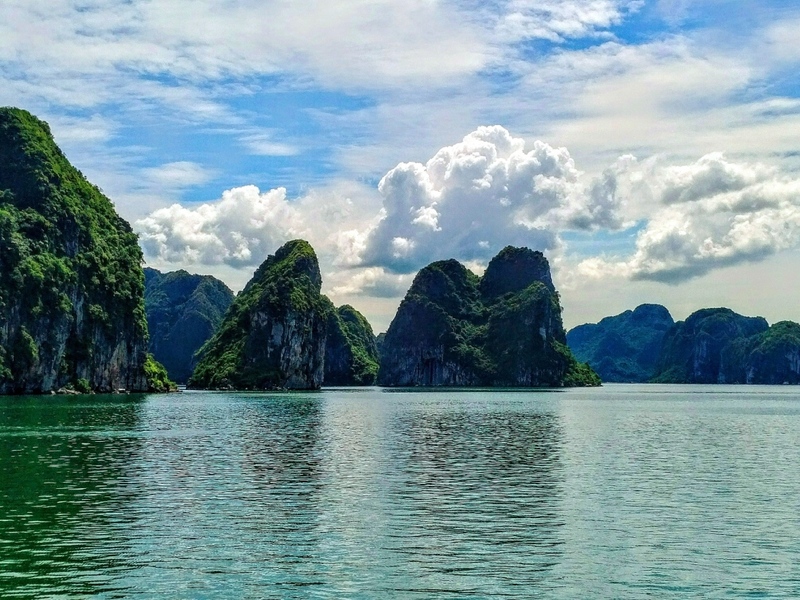 Halong Bay is 115 miles east of Hanoi and the kind of 'you cannot possibly go to Vietnam and not see' place known, as it is, for its thousands of towering limestone islands shooting out of the Gulf of Tonkin's emerald waters. It's a double world heritage sight which looks, in parts, not too dissimilar from the iconic Milford Sound in New Zealand. Our trip out to Halong Bay came courtesy of a luxury vehicle with tour guide Chuong, air conditioning and fully functioning WiFi. After roughing it in the alleyway hotel of Dong Da I don't mind admitting I was fully embracing this short taste of luxury travel - even more so because we were the only two people on the supposedly ten-person tour. This meant we had the luxury all to ourselves - a 'hazard' of travelling around Vietnam at low tourist season. On arrival at the marina we transferred onto a wooden boat called the 'Hai Thanh 18' where we were served a veritable banquet of vegetarian food: noodles, fried tofu and fries. It was delicious but I was careful about what I ate, selecting the fried food dishes only; my bad experience with boat food in Egypt forefront in my mind. We then set off for a cruise around the rising peaks of the bay before docking at the floating village of Vong Vieng where a population of around 50 families live in floating houses surrounded by brightly painted mint green bamboo boats. 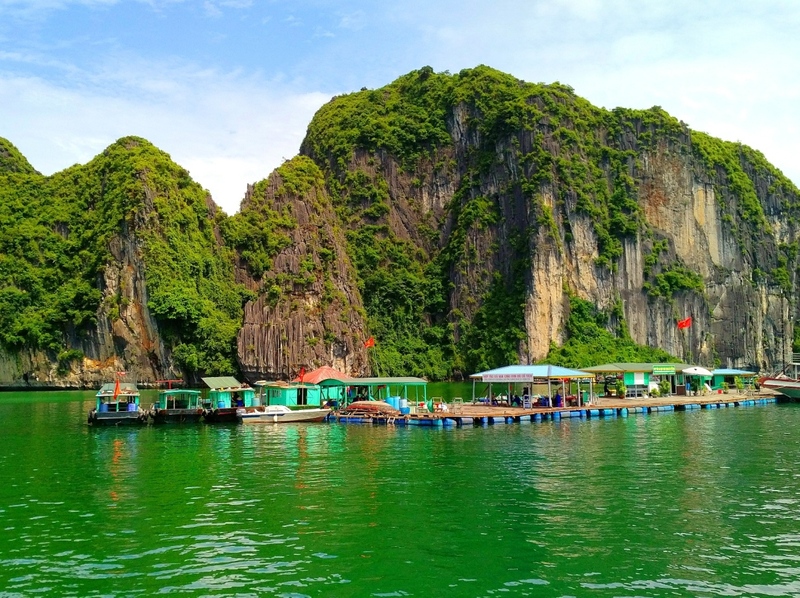 For a small tip of d200,000 a local gentleman, sporting a green Vietnam Army hat with communist red star embellishment, paddled us away, through caves, into tranquil bays of pea green waters encircled by giant forest-covered limestone peaks and back again. Unfortunately for him he didn't spot one of the large stalactites in one of the caves we paddled through, which hit him hard on the head. His communist hat went a long way to protecting him, but we could both tell it really hurt. Out of pity, we tipped him double the expected rate. Halong Bay was as far away from the urban craziness of the Vietnamese city as it was possible to get; the perfect antidote to overwhelming freneticism of Hanoi and Saigon and, sadly, our only direct experience with rural Vietnam on this tightly-scheduled trip around the country. The incredible limestone peaks of Halong Bay; skyscrapers of the natural world. The village of Vong Vieng, home to around fifty families, floats at the foot Halong's giant limestone towers. 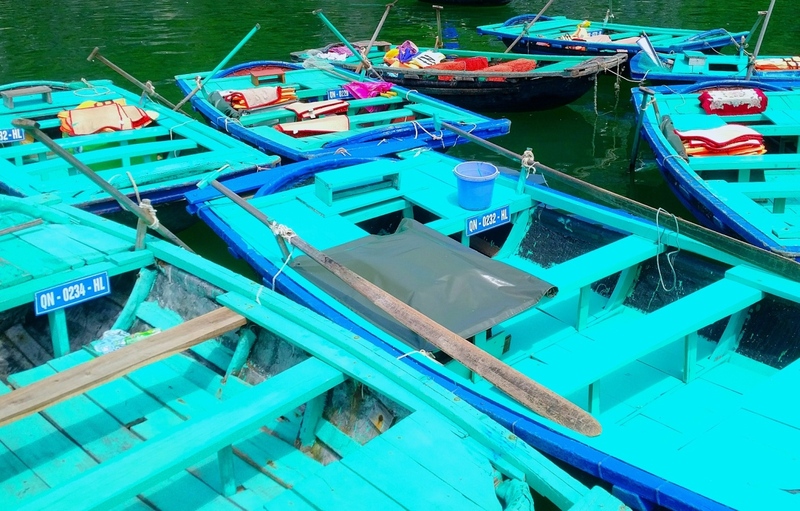 Vong Vieng's cute turquoise bamboo boats. It's advisable that you stick to the party line and refer to Ho Chi Minh City as exactly that - even if it is a bit of a mouthful. Be mindful of what you post online. Save anything controversial for when you get home. Crossing the road is fraught with danger in Vietnam. A Zebra crossing green light is only permission to walk into oncoming scooters and cars. Unlike other countries it is not granting you right of way. Counter-intuitively, walk slowly out into the road as this will give oncoming vehicles a chance to manoeuvre around you. Try to run across and you remove this ability from drivers completely - increasing your chance of being involved in an accident. The Vietnamese Dong is among the most frustrating currencies to use owing to its seemingly infinitesimal zeros. It means that the 'decimal point scam' is one often used on tourists. We fell victim to this, paying ten times more for a taxi fare than we should have. 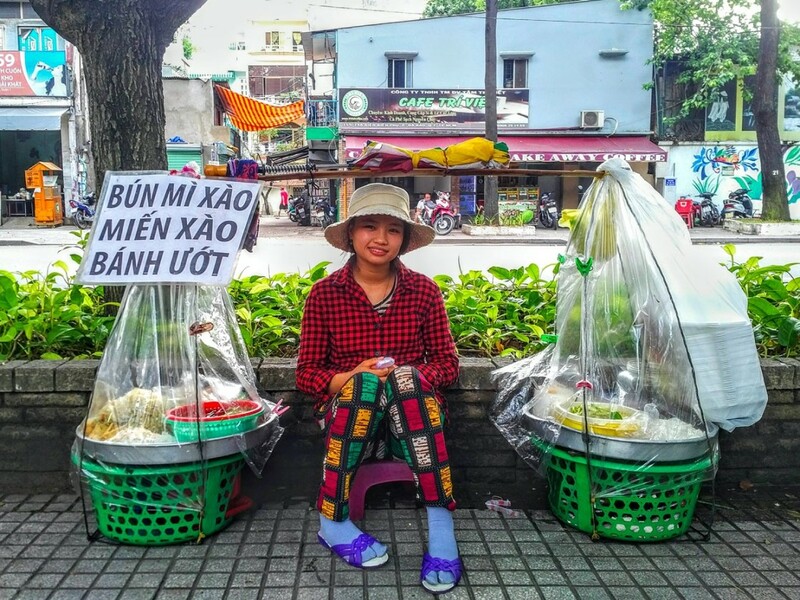 It's a sad fact that in Vietnam, people will try to scam you - and they're likely to succeed. Be on your guard - especially with taxi drivers. Know your currency conversions. If you can stand the heat and humidity, going to Vietnam off season offers some incredible reductions on flight and hotel costs. You may even find yourself on a tour where you are the sole partakers! Vietnam is a cheap country in which to travel - even more so if you're willing to go without a few luxuries. At time of travel, no visa was required for entry into Vietnam for UK citizens. You are permitted a visa-free stay of up to ten days only. On arrival at Ho Chi Minh City airport, I had to show evidence of an onward journey - make sure you have your traveldocuments to hand.